Absolutely! We love our referral perks, and we bet you do too. Perks can include free items or money off your next box, and tend to change based on the promotions we're running. Plus, your friends will get free stuff too! To refer friends and family, click this button to visit your account page. In your account page, you will see Invite Friends and the current referral offer, which can be free items or account credits. The referral offers change to coincide with promotions we're running, etc. To refer via email, type the email address of the person you are inviting into the email field shown and click send. You can also refer via Facebook & Facebook Messenger by clicking the corresponding tabs. Your link is unique to your ButcherBox account and you can share it on social media or anywhere else you like! 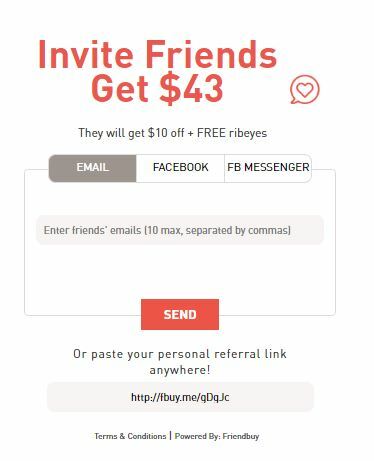 When your friend or family member signs up using your unique referral link, they get an introductory offer and we add the current promotion or $43 credit to your account when their first box ships. You'll receive a credit for each successful referral, which we will automatically apply to your next shipment and can be combined to earn you a free box! Any unused credits beyond the free box roll over to the next month's box. Happy referring and thanks for spreading the ButcherBox love! Referral credits are issued and added by FriendBuy, not ButcherBox. Referral credits are issued when the referral link is clicked to place the order and the referred's initial box ships. In order to receive a referral credit, the referred member must use the referral link provided by the referring member. The offer provided is the offer that was active at the time the referral link was shared. Offer valid for new member subscriptions only. Offer not valid for resubscriptions. The referred member and the referring member cannot be the same individual or reside in the same household. The referred member and the referring member cannot share the same shipping address. The referred member must use the referral link/code when placing their order for the referring member to receive the offer. If the referral offer is for a promotional item, the promotional item will be added to the referred account and the referring account for the first successful referral and a $43 credit will be applied for each consecutive referral on the referring account for that offer. Offer valid for up to 12 referrals at $43 or promotional items per referral per the calendar year. Can we add in here that members are not able to stack promotions and referrals at the same time. Once they add a promotion on top of the referral the referral is canceled out.